Stephen Harris is currently employed as a lecturer at the University of New England (Armidale, NSW) where he teaches across the field of literary studies, with a focus on American Literature, the Contemporary Novel and Nature Writing, and assists in the teaching of film studies. His current research project is a comparative study concerned with individualism in American and Australian cultures. As a member of the interdisciplinary research group WRaIN (Water Research and Innovation Network (UNE)), he is also collaborating on research projects focusing on eco-critical themes and the relationship between literature and the environment. 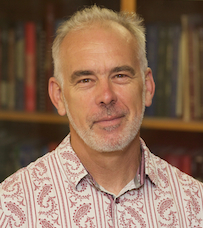 He is presently co-editing a collection of interdisciplinary essays on the subject of water in Australia, to be published in 2016. Among other interests, he is an active musician. Self and Subjectivity in literature. The Contemporary Novel in 21st century culture. Representations of sound and music in literature. The Fiction of Gore Vidal and E.L.Doctorow: Writing the Historical Self, Peter Lang AG Publishers, Bern, July 2002. Gore Vidal’s Historical Novels and the Shaping of American Political Consciousness, The Edwin Mellen Press, Ltd.; December, 2005. “Questioning the Cultural Industry of the Self: Fiction, Selfhood and Individualism in Patrick White’s The Vivisector.”, in The Self-Industry: Therapy and Fiction, (eds. K. Kowalczyk-Twarowski, J. Szurman and A. Wozniakowska), Wydawnictwo Uniwersytetu Śląskiego w Katowicach), Publishing House of the University of Silesia in Katowice, Poland (December, 2015). “Tim Winton’s Dirt Music: Sounding Country/Re-siting Place”, Journal of the Association for the Study of Australian Literature, ‘Critical Soundings’, Vol. 15, No. 1, 2015, pp. 1-13. “Water Wars, Talking Water: Art, Activism and the Eco-politics of Whitman’s Walk on the Water”, Australasian Journal of Ecocriticism and Cultural Ecology, Vol. 2, 2012, pp. 43-55. “Narratives from Another Creek: Judith Wright and the Poetics of Water Australia”, Journal of EcoCriticism, The “Poetic Ecologies” Special Issue; Journal of Ecocriticism, Vol. 1, No. 2, July 2009. Political Animal: Gore Vidal on Power. By Heather Neilson. Monash University Publishing, Clayton (Victoria), 2014; review forthcoming in Australasian Journal of American Studies, 2015.
Review of ‘Southerly: The Political Imagination: Postcolonialism and Diaspora in Contemporary Australian Poetry.’ Eds. Ali Alizadeh and Ann Vickery, ('Southerly' vol. 73, no. 1, 2013), in Plumwood Mountain: An Australian Journal of Ecopoetry and Ecopoetics, v. 1 (2), 2014.
Review of 'The Bioregional Imagination: Literature, Ecology, Place.' Edited by Tom Lynch, Cheryll Glotfelty, and Karla Armbruster. University of Georgia Press: Athens. (2012); in Australasian Journal of Ecocriticism and Cultural Ecology, v. 2, p. 109-111 2012. “Ian Wedde, The Catastrophe”, New Zealand Books, Vol. 22, No. 1, Issue 97, Autumn, 2012. “Sacred Australia: post-secular considerations”, Journal of Postcolonial Writing, Vo. 48, No. 1, February 2012, pp. 110-11.